For librarians and elementary schools, Reading Bingo isn't a new idea. 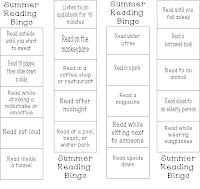 I've seen countless printable Reading Bingo cards online, both free and for sale. At the elementary level, students love Reading Bingo, and it's easy enough to get them excited about it. But middle school students are a tougher crowd. It seems that many middle schoolers either really love or really hate reading. For those students who haven't decided how they feel about reading, the middle years are crucial to creating either a lifelong reader or one who dismisses reading as only a school activity. It is vital that we give these in-between readers that gentle shove needed to land them into the group that loves reading. 1. Make categories both general and specific. General categories enable students to choose just about any book for the square. Examples include: A book someone recommended to you or an audiobook. These could be virtually any title. Specific categories, such as A book with a train or ship on the cover, help keep the game interesting, like a scavenger hunt for books. 2. Don't require them to read all the squares, or blackout, the card. As much as I'd like to see students read 50 books in a school year, I know that this is unlikely for many of them. Far too many middle schoolers find that reading just one book is a huge mountain to climb. Each card I created (links below) contains 16 squares. If students read only one row, there are 10 groups of 4 books to choose from (4 across, 4 down, 2 diagonals). Allowing them to read the four corners adds an 11th option. 3. Allow a class to earn a class party by working together to complete one or two cards. Students could read with a partner or in a book group. 4. Help students stay honest by offering win-win prizes. Lame prizes (pencil, bookmark) don't motivate middle schoolers. Awesome prizes (field trips) will motivate some to lie about or rush through their reading just to get the prize. The best prizes for middle schoolers are prizes that help reactivate the intrinsic pleasure of reading. These prizes might include time out of class to read in the library or using Scholastic points or bookfair proceeds to allow students to choose free or discounted books. Arrange days to take students who want to read outside when the weather is nice. Arrange an author Skype with cookies and hot chocolate. Set up pajama days or hat days or crazy sock days for students who have completed a Bingo row that month. All of these are either free or very cheap, and they reinforce the idea that reading is a pleasurable activity, not just something you have to do for school. I call these win-win prizes because even if the student completely fakes his or her reading, the prize is more chances to read. Few students would fake-read in order to earn more time to fake-read. 5. Please, please make it optional. I get so sad seeing how many "reading incentive" programs are required for a grade. We want students to enjoy reading and to choose to do it. When it comes to reading for pleasure, middle school is make-it-or-break-it time for some of these kids. We need to encourage them to read for pleasure, which is the primary aim of any reading incentive program. Requiring Reading Bingo or any other incentive program for a grade is counter-productive. I've included one Reading Bingo card below, and you are welcome to use it. The first one is a freebie, or you can download my other Bingo cards and sets from Teachers Pay Teachers. 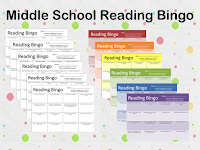 Best of all, unlike most of the online Reading Bingo cards that are usually for elementary students, all of the cards linked below were created specifically for middle schoolers! 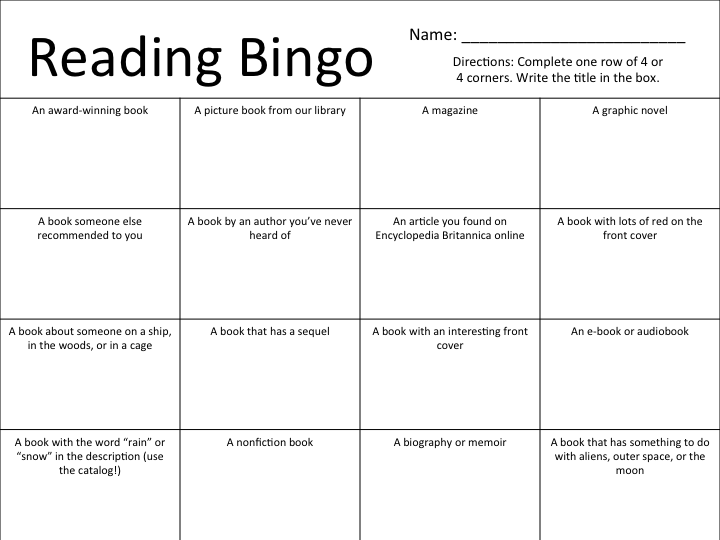 Reading Bingo First Card (Freebie!) --Click to download. 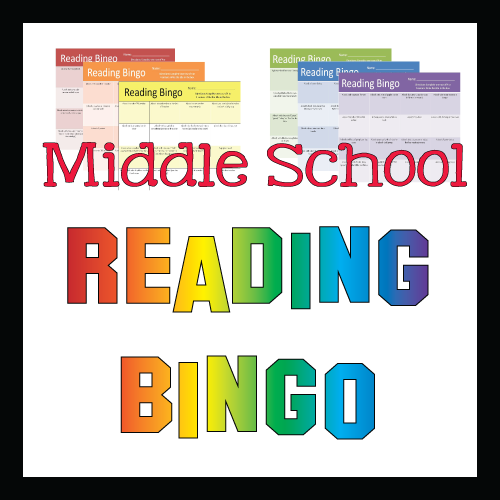 This set includes 6 different Reading Bingo cards and 6 printer-friendly black and white cards. This Bingo card is all about mystery authors, themes, and archetypes. Four different bookmarks on one printer-friendly page. Each bookmark represents a Bingo row. This one focuses more on when, where, and how the reader should read, and as such, is perfect for readers of all ages. 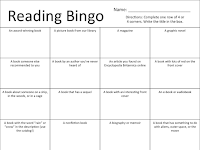 I've never done reading bingo sheets, but they sound like a great way to get students to diversify what they read. I love your take on prizes being MORE reading!